Many of the obituaries of Jerry Lewis have mentioned his popularity in France, but none of those that I have read have talked about Italy. Regular readers of this site know I spend a lot of time in Italy and I can assure you he was/is held in as high regard there as in France. In Italy, they call him Il Picchiatello (the ‘crazy one’ or ‘nutty one’). I’m a huge Lewis fan, for the record — I love Cinderfella, in particular, and I think his philanthropy shouldn’t be dismissed or mocked, as it sometimes is. But I do find some of the European over-intellectualizing of his career — and of cinema, in general — a bit rich. Here is an example from Italian TV. If you speak Italian, enjoy. If you don’t, well, enjoy the sound of the gorgeous language, and stand in awe at the low production values of Italian TV. I have a column in the Wall Street Journal today, folks. Voila. Very happy to report that my portrait of Patches (now, “Richard”) was selected to be put on display in the front window of Toronto’s Arts Market during the first two weeks of August to help promote volunteering (and specifically, volunteering for Annex Cat Rescue). 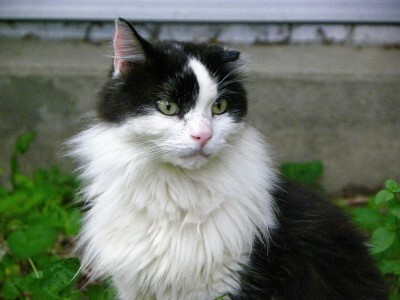 Richard was an outdoor cat for years – nearly 14 – and now has found a home in which to live out his retirement. He is an FIV+ cat and considered ‘semi-feral,’ making me all the more delighted that from here on in he will know only love and comfort. It seems to me there is enough to analyse and criticize and investigate and report about President Trump and his administration without resorting to truly absurd stretches, such as this one. Despacito is a gorgeous song, and it is successful now for that reason. To suggest some deep relevance based on current affairs strikes me as a desperate attempt to tie virtually everything to Trump. Why not ask about the success of Eres Tu (an even more beautiful song, in my view) and its connection to President Richard Nixon, or even La Bamba and the importance of the Eisenhower administration in bringing about its popularity? I found this documentary on YouTube – simply haunting. There are two parts. This is the first part – Part 2 can be found quite easily, if you are interested. …it was impossible to live in England or visit any European country in the early 1950s without being forced into a constant awareness of oneself as an American, and an unproblematic awareness at that. …I was able to do a lot of traveling, and as happened with so many of my contemporaries (updated Columbuses all), it was the American in myself I stumbled upon while trying to discover Europe. For protest as we all might, the whole world insisted on regarding us quite simply and unarguably as Americans: we spoke English with an American accent, we carried American passports and travelers checks from American Express, we were overawed by cathedrals, we were buoyant and wide-eyed and talkative, we had good teeth and smooth complexions, we complained about the absence of central heating in winter, we were accustomed to modern plumbing, we had a thing about dirt, we preferred showers to baths and took too many of both, we grew impatient at slow service in restaurants, and we drank water more happily than wine. In short, we were in a million small details marked off in their eyes as an identifiable national type.And in our own eyes, after a while, as well. …for the sheer vulgarity of the anti-Americanism one came upon everywhere in Europe pushed many of us into the unaccustomed role of patriotic defenders. There was no way of resisting the invidious comparisons to the benefit of America which popped into one’s head when a waiter in a Paris cafe sneered, “Un Americain, sans doute,” as one handed him a thousand-franc note, or when a particularly philistine Englishman made snooty references to American materialism. Time after time, one would find oneself protesting, “No, it isn’t really like that in America, you’ve got it all wrong,” and then rather to one’s own astonishment one would hear oneself offering a spirited defense of this or that aspect of American life which one had never felt the slightest inclination to defend while at home. As I said, these could have been my words (though they wouldn’t have been written this well had they been mine) from the late 1980s when, after getting my B.A., I went to Paris to study at the Sorbonne and work as an au pair. I was, at that point in my life, a typical Canadian WASP from the Ottawa Valley. I had the typical Canadian viewpoint: Canada is morally superior to the United States; we are peacekeepers; we are a mosaic, not a melting pot; we have free healthcare; we have no guns; we are not just different than them, we are better than them. It was, of course, mostly hooey; or the narcissism of small differences. I remember watching the movie Baghdad Cafe in a Paris movie theatre and feeling crazily homesick. What I saw on screen was the freedom and openness of individuals being who they were, dressing as they wished, letting it all hang out, for better or for worse. It was something I missed while living with a wealthy French family and studying with mostly European classmates and professors. In short, I came to see myself as a North American, or a Canadian American. I was still happy to be Canadian, but no longer insulted to be thought of as American. Podhoretz mentions “the sheer vulgarity of the anti-Americanism” he encountered in Europe. This was the 1950s. In the late 1980s, it was vulgar and then some. It was relentless, in particular, the attacks on Ronald Reagan. It’s interesting to keep this in mind, because when George W. Bush was president, there was a received wisdom that he inspired an unprecedented anti-Americanism. Simply not so. When George W. Bush was president, I was taking French classes in Toronto — to keep up my language skills — and the rhetoric against Dubya from my teacher was at fever-pitch. And yet, I remembered that it had been just as bad in the ’80s. Reagan was a child; a Nazi; a bully; heck, Americans were all big kids! Nazis! Bullies! They were stupid! Reagan was a cowboy; heck, so were Americans! Et cetera, et cetera, et cetera. I came to believe that Europeans envy American optimism so much that they dismiss it as childishness. For me, it was like seeing the worst, most self-satisfied side of Canada clearly for the first time. Listening to my French friends talk about the U.S., all I could think was, Is this how we sound? Because if this is how we sound, we need to grow up. It was the same kind of snide, disparagement of Americans accompanied by the same, bizarre obsession with them, the same envy. Europeans, like Canadians, have an obsession with getting attention from the U.S., all while holding them in contempt. This put a serious dent in my anti-Americanism and went a long way to changing my world view. Currently, I spend a good deal of time in Italy — on average, three months a year. I am sad/resigned to report to you that the attitudes about gli Americani have not changed from what I observed 30 years ago in France, or, apparently, from what Norman Podhoretz observed more than 60 years ago in England. Americans are stupid. They are naive. They are big kids and cowboys — again with the cowboys! Europeans need to find a new insult — and plus, they don’t notice us enough. And I actually do not think Trump has made it worse, believe it or not. His presidency just gives them another reason to shake their heads in wonderment at the big children who would take such a risk. So oddly, perhaps, I find myself defending Americans and American policy a good deal these days in Italy, just as I did during my time in Paris. Podhoretz called it being in the “unaccustomed role of patriotic defender.” I don’t know what I would call it, since I am not patriotic about the United States. Maybe it is nothing more than a lack of patience with assumptions, not to mention displays of ignorance/ingratitude, but I have confronted it on many occasions. A couple of years ago, a history prof of mine in Italy asserted that his country had been liberated from the Nazifascisti by i partigiani (the partisans). Period. No one else helped. I put up my hand and said that, as courageous as many partigiani were, without le Alleate (the Allies), Italy would not have been liberated. Certo, he replied, without missing a beat. He had just, he said, forgotten to mention that detail. He was smiling as he said it, but I could tell he hated me ever after. So this has turned into a rather longer post than I had intended, but if you can take anything away from it, it is this: read Podhoretz. And if you’re interested in two or three of my pieces on Canadian anti-Americanism or Canada-U.S. relations in general, please check out this from the Christian Science Monitor (where I do indeed focus on some ways in which Americans can learn from Canadians, though please remember this was written in 2011), and these two from Huffington Post.